47 yo female TM meditator since 1971, consistent. Activations in orbital and ventral medial prefrontal cortex. Deactivations widespread. Subject stated she was having trouble breathing during scan. 24 yo male, self-taught since 2007 intermittent. 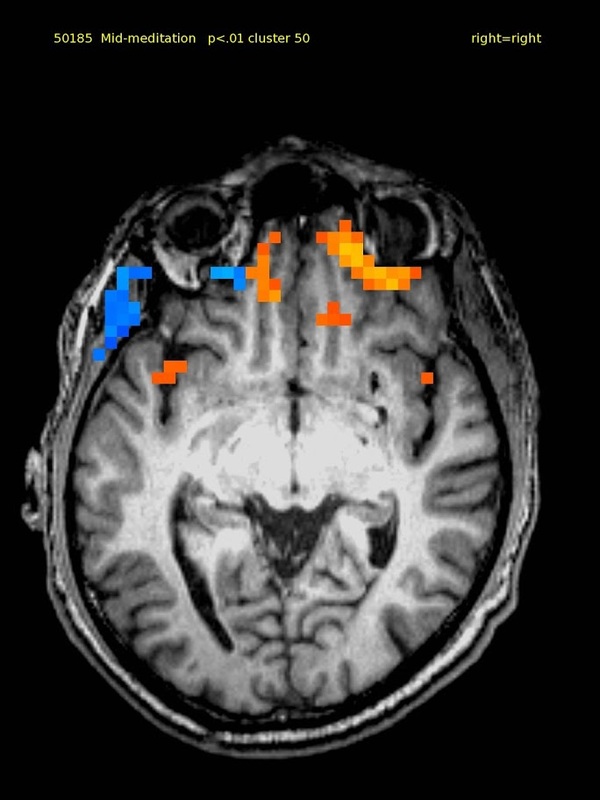 Activations in bilateral superior lateral frontal cortex. Deactivations widespread. 43 yo female, experienced. TM meditator since 1974. Activations in bilateral frontal, medial frontal and right superior parietal cortex. Deactivations widespread. 61 yr old male, experienced TM meditator since 1971. This axial slice shows activation in the ventral medial prefrontal cortex and deactivation in the thalamus and adjacent areas. 58 yr old female, experienced. TM meditator since 1971. Deactivation in ventral medial prefrontal and post. 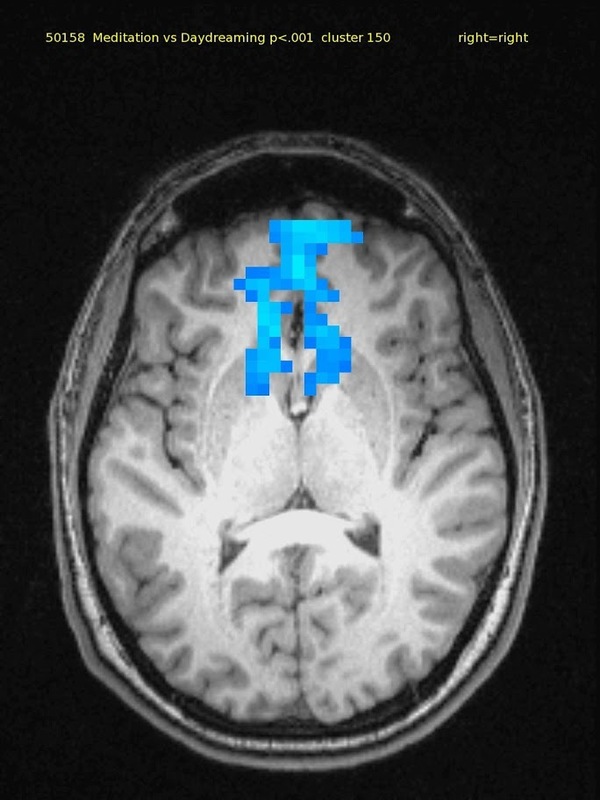 cingulate cortex and activation in left insula. 37 yo male TM meditator for 1 month. 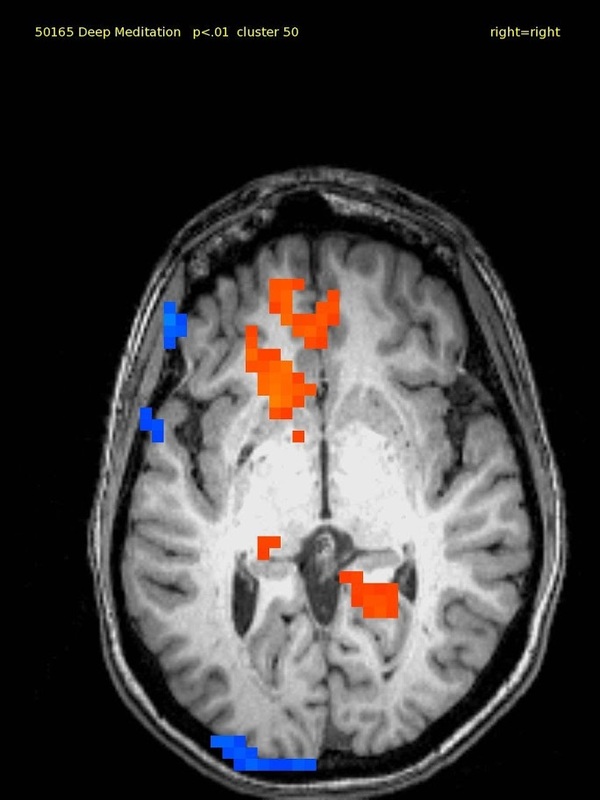 Activations in bilateral orbital and medial frontal and right inferior parietal cortex. Deactivations in bilateral auditory and lateral frontal cortex. 61yo male, TM meditator since 1970. 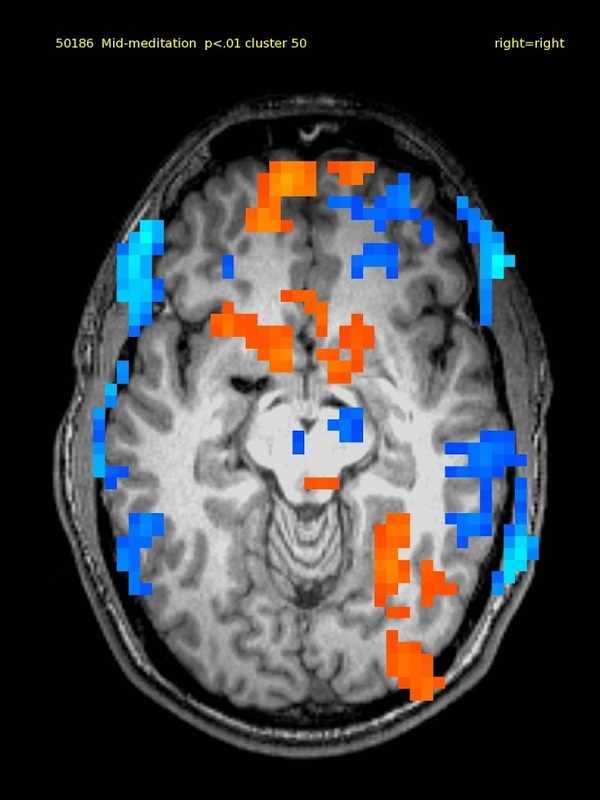 Activations in ventral medial prefrontal, but also widespread. Deactivations in bilateral thalamus. 29 yo female novice. TM meditator since 11/2008. Activation localized to right ventral medial prefrontal cortex. Deactivations seen in thalamus, post. cingulate, auditory & frontal cortex bilaterally. 61 yo male TM meditator since 1973. Activations in bilateral inferior lateral and orbital frontal cortex. Deactivations were not significant. 23 yr/o female, novice. TM Meditator since April, 2008. 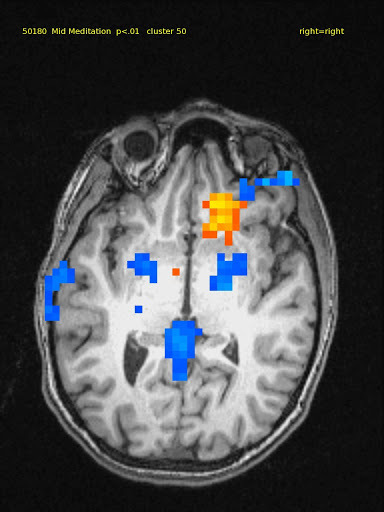 High axial slice shows bilateral parietal activation; auditory cortex is silent. 60 yr old female, experienced TM meditator since 1970. The brain is very quiet except of activation in the ventral medial prefrontal cortex and also in the medial inferior temporal cortex. 26 yr/o Female Novice TM Meditator. Widespread Activation. 61 yo male, TM meditator since 1970. No activations. Deactivation in visual cortex only. 23 yr/o female TM Meditator since April 2008. Auditory cortex is silent. Deactivation of the Default Network. Deactivation in visual cortex. 23 yr old male, taught meditation in school class and practices intermittently. Deactivation in medial frontal cortex. 7 yo male TM meditator for one month. Activations in left orbital and right inferior lateral frontal and left superior parietal cortex. Deactivations widespread. 24 yo m novice. Activations: bilateral superior parietal, & lateral front., right inferior front., right insula, & left temporal cortex. Deactivations: bilateral medial front. & ant., post. cingulate. 64 yr old male TM meditator since 1970. 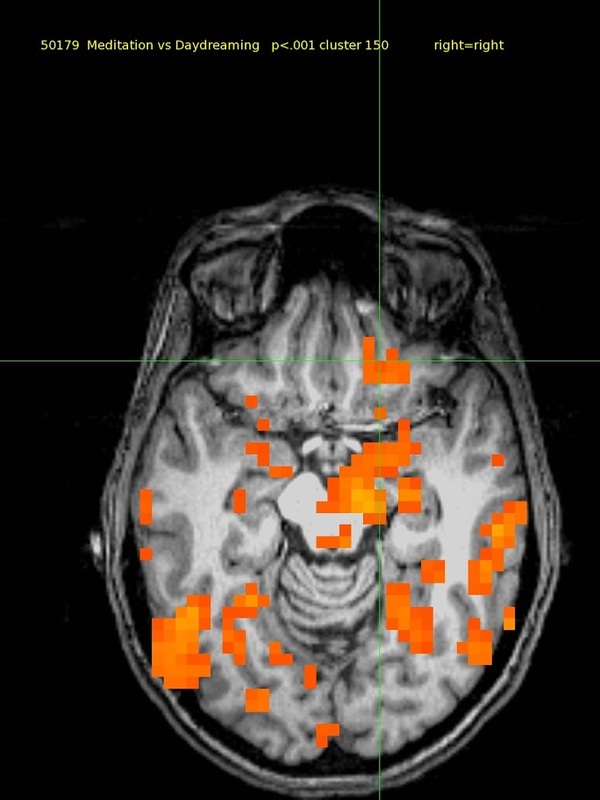 Activations in medial frontal, right parietal and posterior cingulate cortex. Deactivations in bilateral inferior lateral frontal cortex. 20 yr old female TM meditator since age 4. Activation in left inferior lateral frontal cortex Deactivation in left anterior frontal cortex. 60 yr old female TM meditator since 1970. High axial slice shows activation in right superior parietal cortex. 43 yo female, experienced. TM meditator since 1974. 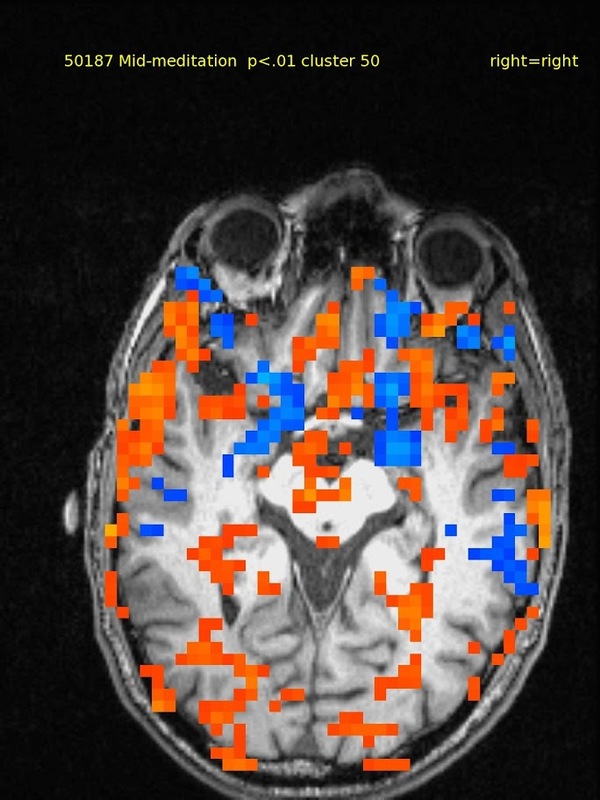 Activations widespread including amygdala. Deactivations none. 47 yo female. TM since 1971, consistent. 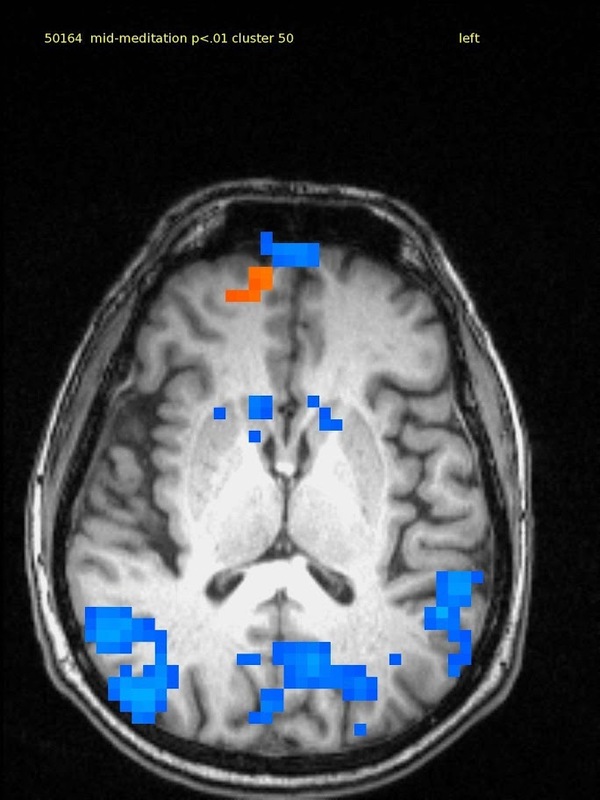 Activations diffuse except visual, and cingulate cortex. Subject stated she was having trouble breathing during scanning.